Each year, over 60,000 Israelis travel to India --many of them “unwinding” in the country after completing military service. Their presence is highly visible across much of the country. Indeed, the “giant shadow” Israelis cast in India is wildly disproportionate to the miniscule dimensions of their homeland. In some outlying locations, Israelis comprise a dominant percentage of foreign visitors. Even in central sites such as the main market in Old Delhi it is not uncommon to see Hebrew signs and encounter merchants able to converse with Israeli customers in fairly fluent Hebrew. On the political and diplomatic fronts, the two nations were largely estranged for the four decades following their independence in the late 1940s. Thus, although India recognized the State of Israel in 1950, the then-ruling Congress Party eschewed full diplomatic relations, siding with the Palestinians and denouncing what many in its ranks termed the "Zionist enterprise" as an imperialist creation of Western colonial powers. and the anti-Israeli attitude of the non-aligned movement, in which India was a leading member. As the first Indian premier to visit the Jewish State, Modi has unabashedly cast aside any restraint in forging future relations with Israel. Indeed, despite his country’s heavy reliance on oil from the Middle East (or “Western Asia” as the Indians tend to call it)—chiefly Iraq, Saudi Arabia and Iran—Modi appears to have come to the conclusion that India has more to gain from throwing in its lot with Israel than with the Arab States, who seem to consistently lend their support to India's rival, Pakistan. In September 2015 Modi launched his “Make in India” initiative to encourage foreign corporations to manufacture their products in India. To date it appears to be an impressive success, with India emerging as the top destination globally for foreign direct investment, surpassing the United States and China!In his effusive welcoming address on Modi’s arrival, Netanyahu mentioned Modi’s “Make in India” project and added a twist, suggesting an additional project: ”Make with India” in which both countries, would exploit the synergies of Indo-Israeli cooperation and engage in joint ventures across a range of civilian and military fields. Referring to ongoing cooperation in the field of space, Netanyahu underscored--with a touch of hyperbole—the almost limitless opportunities a marriage of “Make in India” and “Make with India” could create. He recalled: "I remember what you told me in our first meeting - when it comes to India and Israel relations, the sky is the limit. But now, prime minister, let me add [that] even the sky is not the limit. We are also cooperating in space." 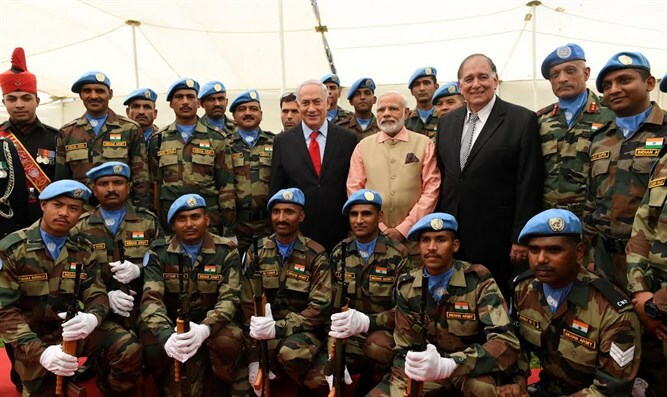 With all due (im)modesty, I was—to the best of my knowledge—the first Israeli to write, in detail, about the strategic importance of India's international ascendency for Israel. Almost two decades ago, in early 1999, I published a policy paper, together with a prominent Indian scholar, the late Prof. M. L. Sondhi, one of the original pro-Israeli voices in India. The paper we collaborated on was entitled "Indo-Israeli cooperation as a US national interest. It was a paper that predicted/prescribed much of the later developments between the two countries, across a range of various fields. Significantly, one of the areas which we identified as being of particular potential was that of cooperation in the naval sphere, especially in regard to security in the Indian Ocean, predicting that, in light of the specter of a potential non-conventional threat, it would become an increasingly important theatre of operations for Israel. This has indeed proved true in light of Iran’s nuclear program, greatly enhancing its strategic importance for Israel's navy and especially its submarine arm, which has become a vital component of Israel’s second-strike capability and its deterrence posture vis-a-vis a nuclear rival. Martin Sherman is the founder and executive director of the Israel Institute for Strategic Studies. His weekly INTO THE FRAY column appears on Arutz Sheva and other major sites.